Our thanks to Zoltan Csirko, SLA Europe Events Committee Member, who kindly accepted to offer a review of the SLA Europe Summer Soiree 2017. 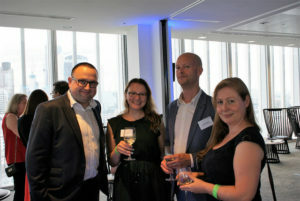 Soon after the temperature reached never before seen figures, we gathered for this year’s Summer Soirée, and once again the News Building at the Shard Quarter provided an excellent central location for the high-point of SLA summer events, even as we went through the rigorous security checks at the main entrance. On arriving to the 17th floor, first breath-taking views welcomed us then a sight of endless glasses in the bar waiting to be fil led with a range of (mainly alcoholic) drinks, and soon a selection of canapés followed. After the spectacular views were taken in, several times for the first-timers and the non-London based guests, catching up with old friends and colleagues commenced. Rovnako tak sa teším na nadväzovanie nových známostí,,en,Čoskoro všetky oči sa obrátili na javisko s City-in-slnka-pozadia,,en,a prvý na rade bol Janne Friis,,en,UK obchodný riaditeľ spoločnosti Dow Jones, ktorý privítal viac ako,,en,z nás,,en,Potom Marie Cannon,,en,tohtoročné President,,en,zaviedla,,ro,ed udalosť,,en,poďakoval Janna a Dow Jones za sponzorovanie akcie,,en,a zaviedla Geraldine Clement-Stoneham,,en,SLA Europe kandidát na SLA predstavenstva,,en,Potom sme boli preč, aby sa teší pohľad,,en,prst potraviny a všetky príležitosti na vytváranie sietí,,en,Vzhľadom k tomu, príslovia,,en,Čas letí, keď ste medzi priateľmi,,en,najmä ak by sa dokonca poukázať vo vzdialenosti kancelársku budovu ste pracovali na,,en,zatiaľ čo spoznávať nové tváre,,en. Soon all eyes turned to the stage with the City-in-sunset-background, and first up was Janni Friis, UK Sales Director for Dow Jones who welcomed well over 100 of us. 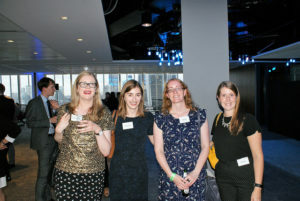 Then Marie Cannon, this year’s President, introduc ed the event, thanked Janni and Dow Jones for sponsoring the event, and introduced Geraldine Clement-Stoneham, the SLA Europe candidate for the SLA Board of Directors. 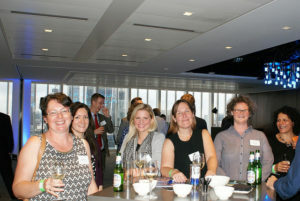 Then we were off to enjoying the view, the finger food and all the networking opportunities. As the proverb goes, time flies when you are among friends, especially if you could even point out in the distance the office building you worked at, whilst getting to know new faces. Zázraky sa dejú - bod na pre čašníkov pretože naše okuliare nikdy nedostal prázdne až do konca veľmi dobre navštevované večer,,en,klobúk dole k SLA Udalosti výboru a Dow Jones za všetku prácu v organizovaní akcie,,en. Konečne, hats off to the SLA Events Committee and Dow Jones for all their work in organising the event.